I just acquired two lovely plates at auction simply because I really liked them even though I couldn't find any information about them before the auction. The mark is very similar to a Qianlong mark, but not very well executed at all. I think it may just be an imitation. The pink color is also similar to some pieces I've found online that have been authenticated. But the decoration and mark are way off. 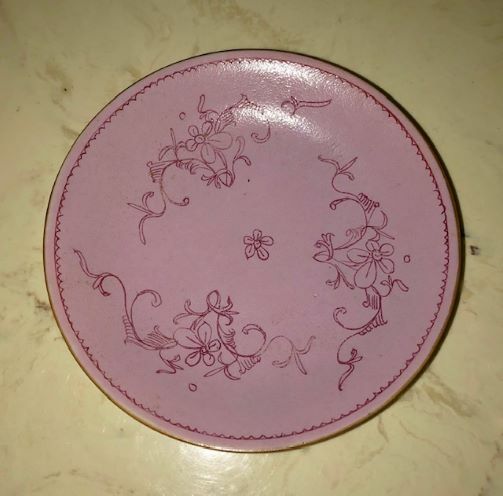 The edges of the plates appear to be brown glazed, but when I look at it through my magnifier the color is the same as what I took for rust spots on the pink enamel and the rim of the foot. Any insight is appreciated. Subject:Re: Qianlong mark or imitation? That's a perfectly good Qianlong-period dish with a 'Minyao' (popular kiln) base-mark and a protective 'Batavian' glaze around the rim. 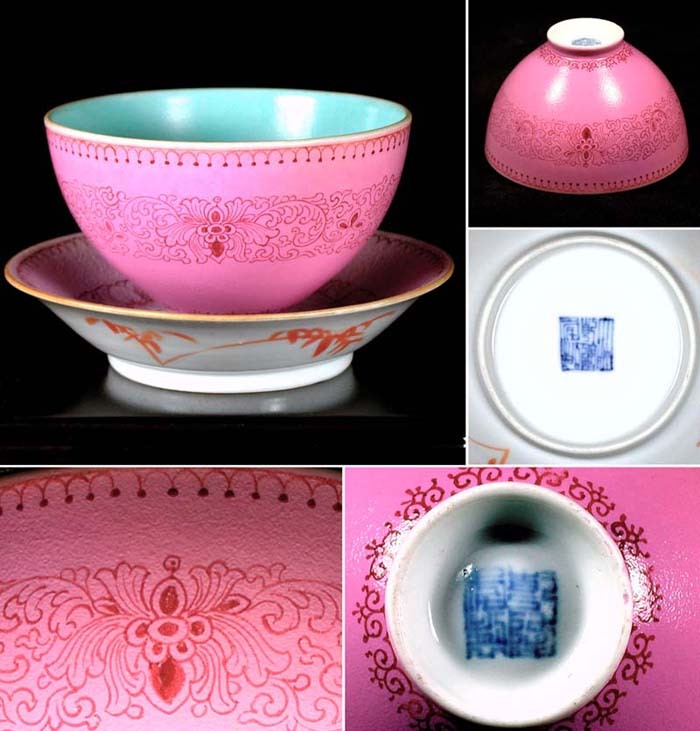 Below is another one with a bowl on it that has a deeper pink glaze, both with Qianlong marks of the period. The bowl doesn't have the brown glaze at the rim. 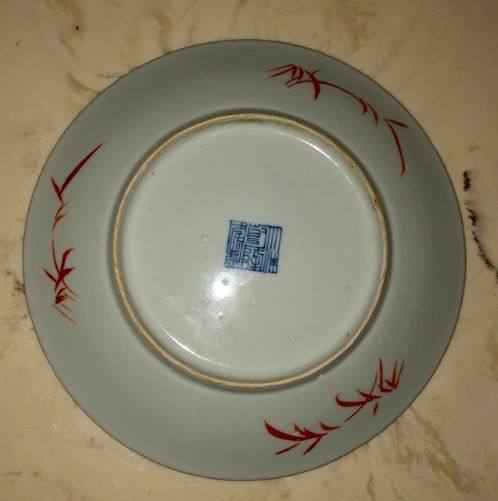 The decoration beneath the rim is of bamboo leaves that I've been told are cyphered into Chinese adages on various dishes, however, I'm at a loss when it comes to what this one might say. Thank you once again, Bill, for sharing your knowledge! I was going to ask you for some beginner resource referrals but before I did, I wanted to make sure the information wasn't already posted somewhere. I found this post "Learning... ( China & Japan ) - Jack - Sep 19, 2018 (05:01 AM)" that has what seems to be some good starting references. But I didn't see input from you. Do you have any other recommendations for a novice? If you're looking to learn Chinese, I lack any universally available fonts of knowledge to add to what others provided in that forum thread last year. In my case, I had a Chinese spouse and thus an extended Chinese family to help reinforce the grounding I received in the language during a couple of years in American Foreign Service schools in the USA and Taiwan. If you want books that can help refine your knowledge of Chinese porcelains, the late 20th and early 21st century books by Anthony J. Allen (Tony Allen in this forum) are a good place to start and still available online. Also the New York Metropolitan Museum of Art's "A Handbook of Chinese Ceramics", by Suzanne G. Valenstein, offers a succinct and quite readable broad-spectrum overview of the subject. Finally, Gerald Davison's "The New & Revised Handbook of Marks on Chinese Ceramics" (2013 2nd Printing of 2010 Edition) has over 3400 markings in formats meant to be searchable by users untrained in the language. Thank you, Bill! I will likely purchase one of the online books today. I haven't been able to find the last one you mentioned. I see references to it quite often. Sorry about the sold-out marks handbook. It had been a while since I checked. I see that a handful of new and used editions are listed on Amazon, but they are now treated as rare editions with a commensurate hike in prices. I received Tony's book on late Chinese porcelain yesterday and have begun my "studies". You've set me on the right path for sure. Mr. Davison's book will be a future investment down the line. But I feel I have a good start with the book and the wealth of knowledge available in the forum. I'm very grateful for the guidance. Enjoy! It's an honorable avocation.